In April 2017, two RTI activists sought to know building rules from the Pallavaram Municipality, after a Reliance Fresh outlet was opened in the ground floor of an apartment complex. Stating that the outlet is an illegality, the Public Information Officer (PIO) said the building rules imply the ground floor be dedicated for parking. Soon after receiving this complaint, the activists started to receive threatening calls, naturally causing them to place suspicion on the PIO. 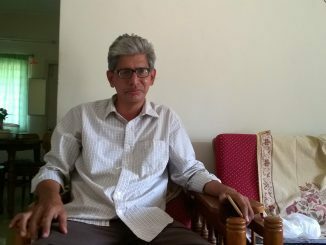 At this point, they lodged a complaint with the Tamil Nadu State Information Commission (TNSIC), the independent body that is mandated to conduct an inquiry and take necessary steps against lethargic or corrupt Public Information Officers (PIOs) in case of proven charges of not providing information or breaching confidentiality policy. However, the TNSIC is yet to initiate an inquiry into the matter. “The commission did not conduct an enquiry. 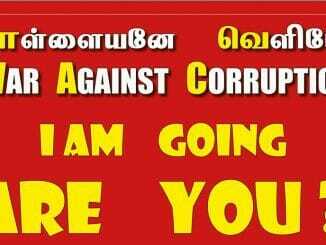 Only if unethical officers are punished would PIOs refrain from corrupt practices,” said P Nakkeeran, Treasurer, Arappor Iyakkam. Hundreds of pending cases, lack of transparency and bias towards officers explains that a culture of secrecy and official apathy shrouds TNSIC. Hundreds of petitioners who approached the TNSIC to receive information say that it is a mere waste of time, energy and money. 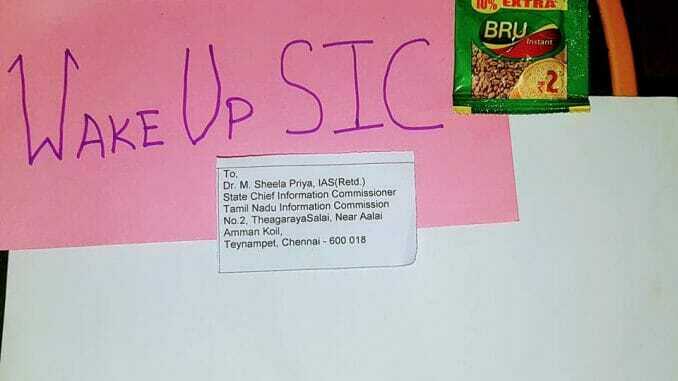 Often, it is not an enquiry that the commissioners in the TNSIC conduct, but something akin to a katta panchayat or settlement, allege some petitioners. Any petitioner who wishes to seek information can file Right To Information to the concerned department. If the information is not provided by the PIO within 30 days of filing the RTI, the petitioner could appeal to the appellate authority (who is the head of the concerned department. For example, Tahsildar is the appellate authority for a taluk office). If the information is not received within three months from the appellate authority, TNSIC can be approached. A majority of the petitioners who were called in for enquiries narrated a typical scene thus: ‘Why don’t you give the information to the petitioner?’ questions the commissioner and the PIO, in a humble tone apologises to the commission and agrees to respond to the RTI petition. “The commission doesn’t realise that the petitioners have wasted a lot of time and money in filing the appeals and visiting the TNSIC office. Why can’t the TNSIC penalise the officers, as that would stall their professional progress and deter other officers from similar malpractice?” asks V Gopalakrishnan, an RTI activist, adding that sometimes, information delayed is justice denied. Section 20 of the RTI act states that the commissioner shall impose a penalty of two hundred and fifty rupees each day (on the PIO) till application is received (in case the PIO has declined to accept an application for unreasonable cause) or information is furnished; however, the total amount of such penalty shall not exceed twenty‑five thousand rupees. “The law remains only on paper. The TNSIC imposes a penalty in rare cases, but has not collected the amount from the officers. 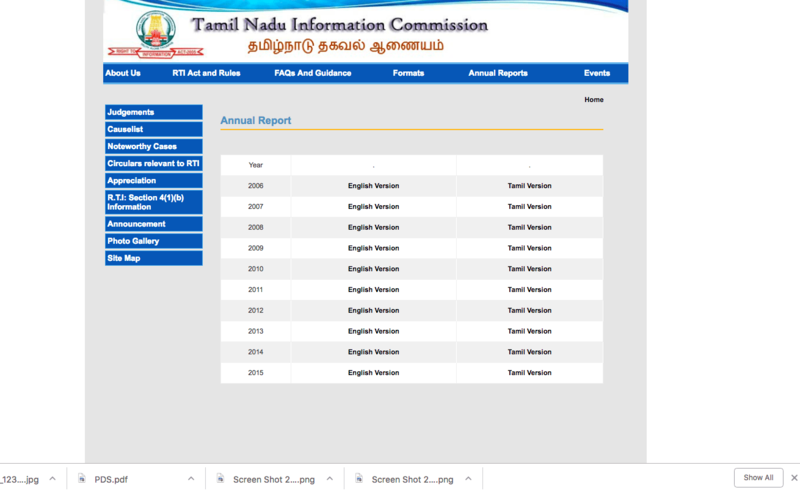 Unlike Kerala and Andhra Pradesh that furnished the details (about penalty on PIOs) on the websites, no such information is available on the TNSIC website,” Shiva Elango of Satta Panchayat Iyakkam points out, adding that the officers in most cases are let go with a casual warning. 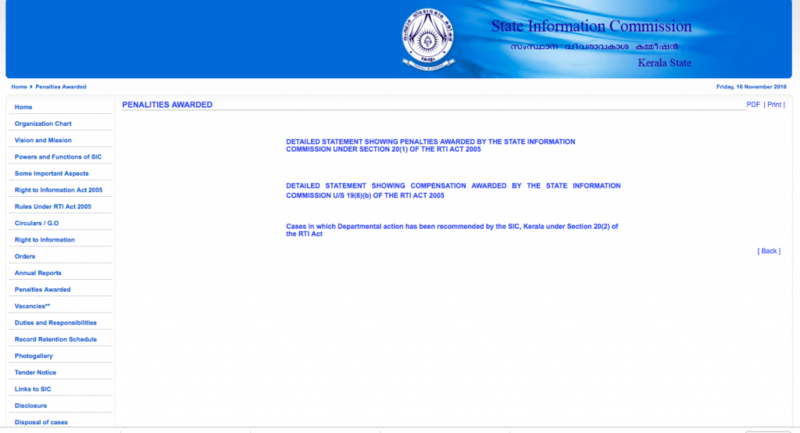 This is the biggest failing of the TNSIC — the lack of transparency and absence of details on the website, unlike in other information commissions such as those of Andhra Pradesh and Kerala — according to Mahesh Kumar, an RTI activist. It is a rare case scenario that the commission orders a penalty on careless officers, who failed to deliver the information on time. In an order dated 16 August, 2013, PIO of the Dindivanam Taluk Office, Senthil Kumar was asked to pay a penalty of Rs 25,000 for not responding to the petition of a 60-year-old resident, Tambu Nalla. The case was delayed before the commission, prompting Nalla to pay four visits to the commission. However, Tambu Nalla, who followed up on the case, says that the penalty was never collected from Senthil Kumar. “I filed RTIs to track the status and enquired in the Taluk office. While the RTI reply stated that the case has been closed, enquiries revealed that the money was not collected,” he says. The SIC of Kerala has put out the information about the penalties issued to the Public Information officers. TNSIC is yet to display such levels of transparency. In the fifteen status items mentioned on the TNSIC website, only one story talks about issuing compensation. The delay in the settlement of cases demotivates RTI activists from pursuing the TNSIC. “RTI petitioners outside Chennai often have to pay more than three to four visits to the TNSIC, suspending their jobs and daily routine. Yet, we visit the office expecting justice to be delivered. What is the point if it is either delayed or eventually ruled in favour of officers?” questioned Ganga Durai, an RTI crusader who filed hundreds of RTI petitions. 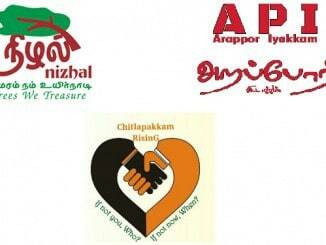 According to a survey conducted by Arappor Iyakkam, the average waiting period for an appeal at the TNSIC is 15 months. The Central Information Commission guidelines mandate each commissioner to dispose 3200 appeals/ complaints per year. “When we take a closer look at the pattern, we learn that 18% of the appeals have to wait for more than a year to reach the trial stage. A total of 135 petitions were waiting for inquiry towards the end of 2015, while the number increased to 502 in 2017,” says Jayaram Venkatesh of Arappor Iyakkam. “The commissioners in Chennai office have a poor record of not disposing any complaints for days together,” adds Mahesh Kumar. When the cases of inefficiency and bias were mentioned to the secretary of TNSIC, the bureaucrat said that there are a slew of issues that hamper their productivity. “There is an infrastructural gap in the commission, due to which certain lapses surface,” the bureaucrat said. However, he declined to comment on the poor productivity of the commissioners. To complete second appeal in 90 days; emergency petitions should be completed within 48 hours. To furnish complete information about the cases, penalty details and others on the TNSIC website.